"There has been an early and continuing interest in raising Ginkgo biloba in Australia. Our search through the original handwritten tree records at the Government’s Yarralumla Nursery in Canberra show that Ginkgo biloba seed was received in the ACT in 1947 from New Zealand and the following year from the NSW Forestry Commission and the Australian Forestry School in the ACT. “Male and female” ginkgos were sent from Japan in 1955, seed from New York in 1956, and from the Australian Embassy in Japan in 1962. Plants of the cultivar ‘Fastigiata’ were sent from Hazelwood Bros in Epping NSW in 1949 and again in 1963.. At this time Kershaw in St Ives, NSW was sending bundles of 200 and 400 seeds of Ginkgo biloba to Canberra and Cohen in Turramurra sent 100 plants." 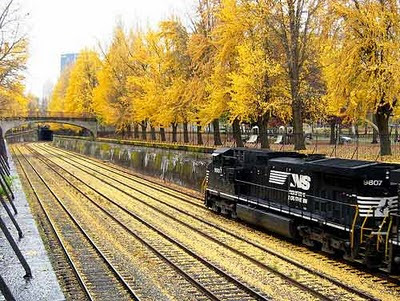 Ginkgo trees in Pittsburgh, Pennsylvania, USA: Northside Train. Adjacent to Allegheny Commons along North Avenue - Northside Pittsburgh. US Steel and Gulf Buildings in background. * New photo photospecial page: Ginkgo tree of c. 1840 in Aubern, New York State, USA. 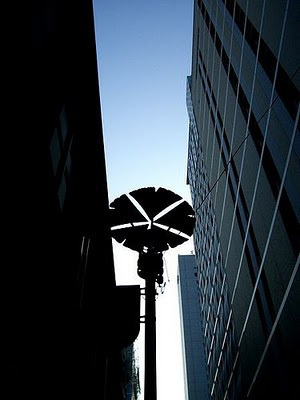 "This street lamp is designed from 4 ginkgo leaves because it stands on the Icho Douri, or the Ginkgo Street. Icho Douri, Shinsaibashi, Osaka, Japan. I have heard anecdotes of early Chinese immigrants in California planting ginkgo trees around mining camps during the gold rush, and that some of these legacy trees may still exist. Can this be confirmed by anyone? This great Ginkgo bonsai tree can be seen in Coal Hill Park (Jingshan Park), Beijing, China. Photo by eregdos (Picasa webalbum). 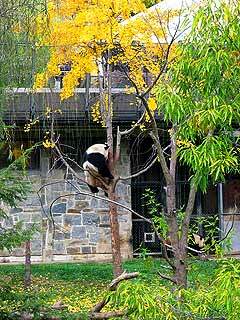 Baby panda in Ginkgo tree at San Diego, Atlanta, Memphis & National Zoo. Photo by RoxandaBear on Flickr.com. 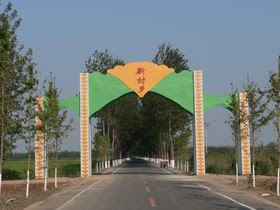 Video with English subtitles on Tudou.com: The Ginkgo tree in China, especially focused on a plantation (leaves, seeds, seedlings, bonsai) of c. 5,000 acres in Xincun, Shandong Province. In this video you can also see the ancient Ginkgo tree of c. 3,000 years old in Xincun. * Added photos of Ginkgo trees in Germany (Bad Durkheim) and Sweden (Lund). 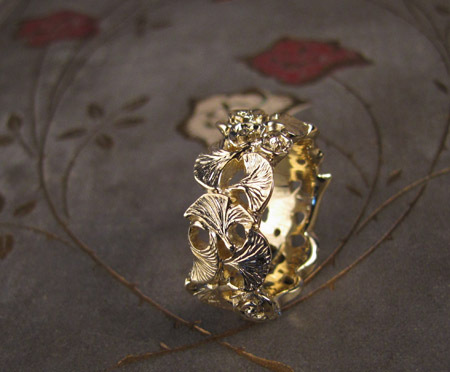 Hand carved Ginkgo (and rose) ring processed from wax model by Cheyenne Weil. 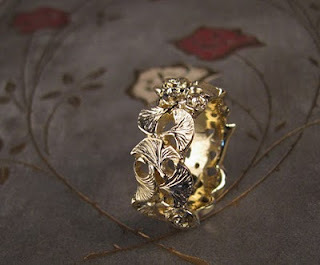 Read about the making of this ring here (with photos).